The Indian Space Research Organisation (ISRO) has successfully launched an electronic intelligence satellite 'Emisat' for the Defence Research Development Organisation (DRDO) along with 28 third party satellites. Switching off and on the fourth stage engine couple of times. The use of the fourth stage as an orbital platform carrying three experimental payloads. PSLV first placed the 436 kg Emisat into a 749 km orbit. Then the rocket was brought down to put the 28 satellites into orbit, at an altitude of 504 km. Automatic Identification System (AIS) from ISRO:- for maritime satellite applications capturing messages transmitted from ships. Automatic Packet Repeating System (APRS) from AMSAT (Radio Amateur Satellite Corporation), India:- to assist amateur radio operators in tracking and monitoring position data. Advanced Retarding Potential Analyser for Ionospheric Studies (ARIS) from Indian Institute of Space Science and Technology (IIST):- for the structural and compositional studies of the ionosphere. 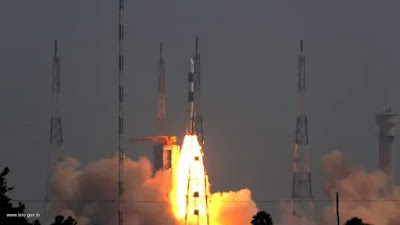 For the first time, the launch also demonstrated new technology of putting payloads into three different orbits with a new variant of the Polar Satellite Launch Vehicle (PSLV) rocket. Q. The Indian Space Research Organisation (ISRO) has successfully launched which electronic intelligence satellite for the Defence Research Development Organisation (DRDO)?